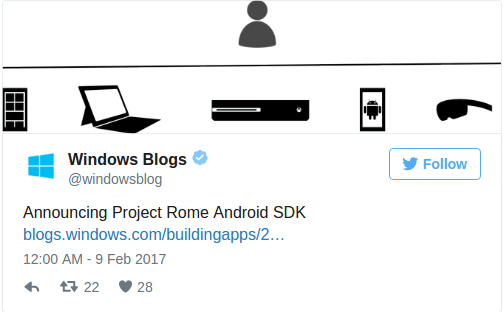 To bridge the gap between Microsoft and Android, the former put out their Project Rome SDK to help integrate Windows apps with Android. Good news for mobile app developers, as Microsoft has rolled out some developer-centric features such as Project Rome. This platform is aimed at increasing user engagement by providing experiences that would blur the lines between consumers and their devices, irrespective of the latter’s operating system or form factor. After shipping Project Rome capabilities for Remote Launch and Remote App Services in the Anniversary Update, Microsoft has now announced the Project Rome SDK for Android. You can download the Project Rome SDK for Android from here. To illustrate the capabilities of the SDK, Microsoft has detailed a situation in which a developer with an app for both Windows devices and Android has users log in with the same Microsoft account. By harnessing the capabilities of Project Rome, the developer will be able to integrate a solution in which the Remote Systems API will discover other Windows devices on the same network as well as through the cloud so that the app is automatically launched on these devices. Microsoft has noted that the Android SDK – which you can download from here – works with both Java and Xamarin. Published at DZone with permission of Varun Bhagat . See the original article here.